Foot pain is one of the more common problems that happens with rheumatoid arthritis. Pain and stiffness in the joints of the toes and the ankles can make walking and standing difficult, especially in the morning. It may take you a couple of hours to reduce the stiffness in these joints so that walking is possible. So what are the best ways to manage rheumatoid arthritis and foot pain? The following is a brief overview of what causes foot pain in rheumatoid arthritis and what types of things you can do to relieve it. Rheumatoid arthritis foot pain can be caused by inflammation that occurs in the joints of the toes, as well as between the bones of the middle foot and the ankle. If the swelling becomes severe or continues long term, deformities may occur at these joints, including bunions, hammer toes, and rheumatoid nodules. 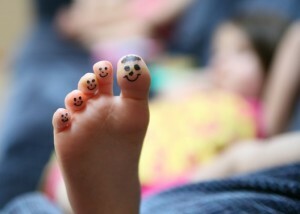 The big toe may also drift inward, crossing over or under the second toe and causing a deformity called Hallux Valgus. WebMD shows a picture of what some of these deformities look like. In addition, severe damage to the middle foot or the ankle can cause the arch of the foot to collapse, resulting in Charcot’s foot. The swelling, skin problems, and difficulty supporting weight on the feet that these deformities cause all result in additional pain, on top of the pain caused by the rheumatoid arthritis itself. Do stretching exercises every morning before getting out of bed. Flex the ankles up and down and circle the ankles slowly in both directions. Stretch the knees, hips and lower back. After standing up, complete heel cord stretches, then sit in a chair and do foot exercises to stretch the toe joints and arch of the foot. Mademan.com shows 5 basic foot stretches that will help keep joints mobile. Shift position frequently during the day. Standing in one place for long periods of time can cause prolonged stress on the joints of the feet, increasing pain and swelling. Sitting for too long can result in stiffness and difficulty walking. Try to alternate sitting and standing tasks throughout the day to allow for changes in position. Stretch frequently if prolonged standing or sitting is required. Exercise regularly. This helps keep joints moving and aids in controlling weight. Be sure to participate in low impact exercise, as high impact activities such as running could cause additional damage to the joints in the feet. Swimming and cycling are examples of low impact exercises that do not put excess pressure on the toes or ankles. Wear comfortable shoes that fit properly. Give up the fancy high heels and the cowboy boots. Shoes that align the foot and support the arch are necessary to combat foot pain. Make sure shoes are wide enough to accommodate any foot deformities without friction on bony areas or nodules. 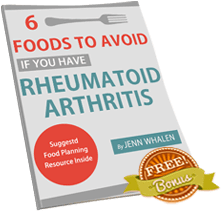 These activities, along with regular anti-inflammatory medication, can help reduce the pain, swelling, and potential deformities that a person with rheumatoid arthritis might experience. A rheumatologist or other medical doctor can also help manage these symptoms and reduce the risk of severe deformities, so regular doctor’s visits are important when managing rheumatoid arthritis foot pain. Previous Post: « Can Acupuncture Help Relieve Rheumatoid Arthritis Pain?